Epoxy floor painting overcomes some of the problems that traditional floor paints have always faced – the friction of feet and wheels passing over the surface, attack by spills and harsh cleaning chemicals and, in outdoor locations, the effects of the weather over time. It’s quite common to tackle these problems by applying a thicker layer of paint – just think of traffic and road markings for proof of this – but that can massively increase the drying time and leave a raised line of paint on a previously smooth surface, which is actually easier for the elements to get in at from the sides. Epoxy floor painting solves all of those problems. It’s a modern, performance material that lends itself perfectly to painting in any vivid colour you could want, while clear epoxy resin can protect surfaces without adding a colour finish. Epoxy painted floors can be smooth or textured, depending on the level of grip you need under foot, so it’s a great option in warehouses for employee health and safety, and for industrial flooring and car parks to make sure nobody slips. As a hard wearing material that bonds tightly to the surface below, epoxy paint layers can be very thin and still will not wear away under the friction of passing foot or vehicle traffic – this makes for an almost seamless finish without the bumps and ridges of traditional traffic paints. Easy to apply and quick drying – we have specialist equipment to get the job done. Brightly coloured and can incorporate lane markings and other graphics. Can be textured to give added grip for feet and wheels. Suitable for use outdoors for demarcation, traffic markings and so on. 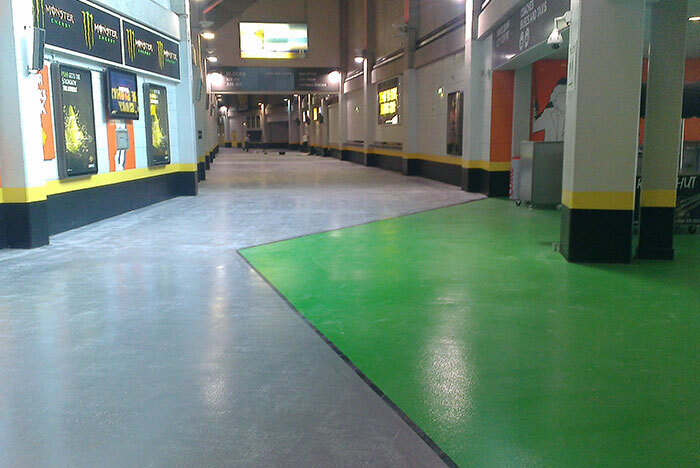 Epoxy paints can be used on existing surfaces – they don’t have to be part of a completely new resin flooring installation – but we can assess your current surface and advise you on the best course of action. We supply all of the equipment and manpower needed. We just need access at an agreed time, and for long enough to get the job done and allow the quick-drying epoxy to set.